A couple of weeks ago I posted a strategy by the GOP House leaders that would force the Senate to vote on the defunding of Obamacare and put those vulnerable Dems from Red States who are up for election on record [enhancing their demise]. While they have abandoned that strategy to follow the Sen Ted Cruz/ Sen Mike Lee strategy of putting the defunding of Obamacare in a continuing resolution that funds all of the rest of government, the effects will be the same. And in my opinion they will be all good for the GOP! When this resolution passes the house today, there should be no reason for any GOP senator to vote against it. They can't say on the one hand it has no chance of passing but on the other hand they can't vote for it because it will ultimately result in shutting down the government because if they really think it has no chance of passing, their vote to vote for it won't matter anyway. The Senate will then, after this resolution fails, pass a resolution to fund all of the government including Obamacare and the two bills will go to conference where a continuing resolution will eventually emerge. So, while the government will not be shut down and the defunding of Obamacare will eventually fail in the senate, the GOP should vote for defunding unanimously, like they were unanimous in voting against Obamacare, as this will put the GOP on record as totally against Obamacare and willing to do everything in their power to stop it. It makes the GOP position clear against Obamacare and it forces those vulnerable Democrat senators from Red States to go on record, and probably enhance their demise in 2014. ...will be very helpful to the Republicans to holding the House and winning the Senate in 2014. I really hope this is where the GOP can come together." So, while the resolution to defund Obamacare will almost surely fail in the senate, this is the winning strategy for the GOP. 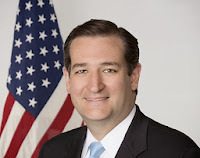 I am with Hugh Hewitt in his great column today in townhall in saying Bravo, Ted Cruz!